Halloween is coming! It is one of my favorite holidays! Even as an adult, and I still get excited every year about picking out my costume. This year I discovered TV Store Online. I had no idea that they sold Halloween costumes! In fact, TV Store Online is one of the largest online retailers today of Halloween costumes.Their costumes have been featured on The Today Show, Live with Kelly and Ryan, Good Morning America, and the Ellen Show, so you know they’re something special. These brands are also a national partner of charity organizations such as Toys for Toys, Arthritis.org, and the Smithsonian Zoo. That is pretty great! I am so excited about this! 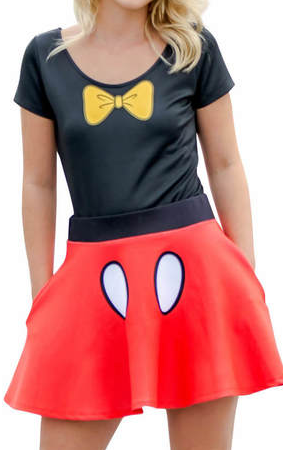 It comes in two pieces, first a bodysuit, then a cute red skirt that looks just like Minnie Mouse’s! The whole thing in its entirety, is made from the highest quality material. I can tell by looking at it that it is made very well, and will last a long time. It is not one of those cheaply made Halloween costumes that will fall apart after one or two wears. Being 95% polyester and 5% spandex, it is super cozy and nice and simple. I cannot wait to wear this at school! (I am a second grade teacher, by the way!) 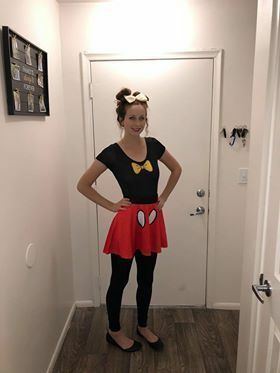 The great thing about this adorable costume is, you can wear it either with leggings or without, and it is still very cute! I am completely in love with TV Store Online. It makes Halloween costume shopping feel so much easier with their great ideas and wide variety of genres. They have great customer service and ship really fast. If you’re looking for something unique that is great material and super cool looking, go check out TV Store Online! You will not be disappointed!